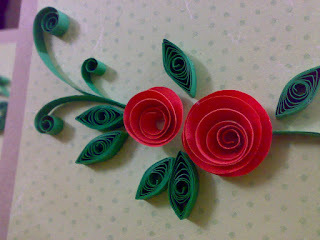 This flower is a very simple one. 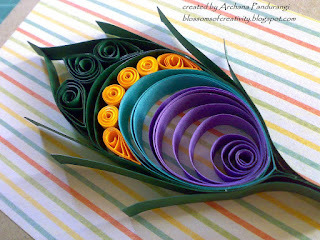 You can find the flower tutorial here. 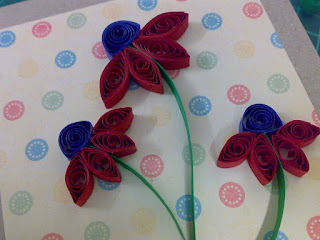 Quilling is going a long way on my craft table. 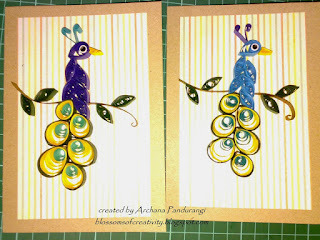 I tried the peacocks with a little variation in the colours. 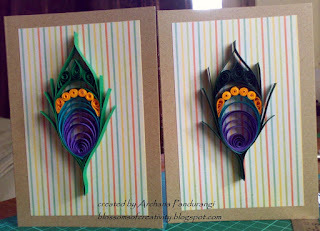 This card came from the inspiration of Inna's Quilled Peacock. I did my bit of changes. 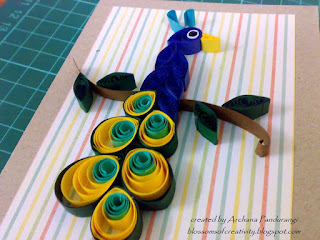 I used three colours of strips(1/2 strip of each colour for each feather) and stuck them together and quilled it. The eye is a tight roll of white and black (1/4th strip each colour)stuck together and inserted in the head piece later while sticking on the main card. 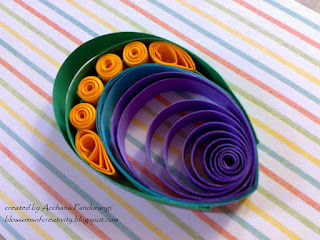 It is time consuming but worth trying. I would recommend all the quillers out there to give it a try. It looks difficult but actually isn't. 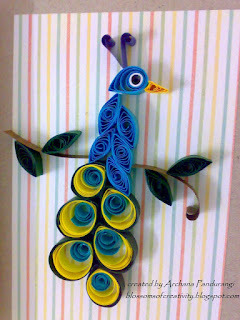 Took some time to make it but it was worth all the effort. A close-up. 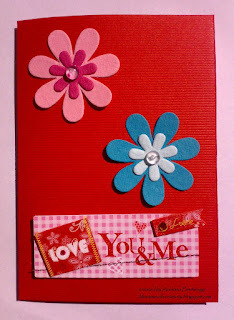 Just a variation in the 3 squares card. This one was a quickie.Stickers can make life easy! 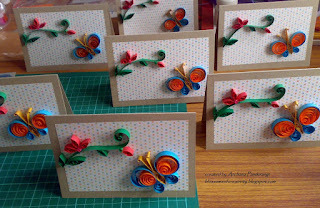 Cut 3 pieces of strip depending on the card size and the desired look. Turn the ends of the strips with your fingers. 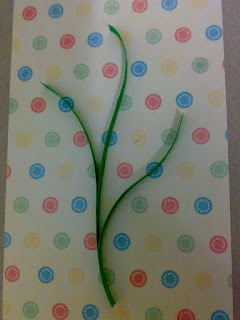 Use 1 full strip for the larger flower's bud and half a strip for the smaller one. 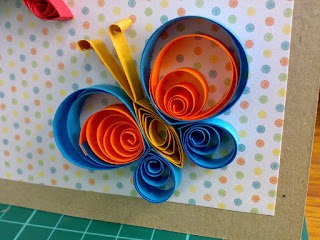 Glue it into a loose coil and press it from two points to form the shape. 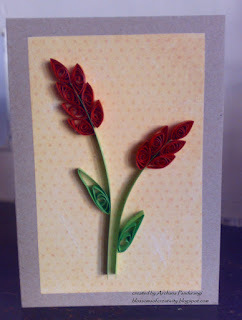 Adhere it to the tip of each stem. 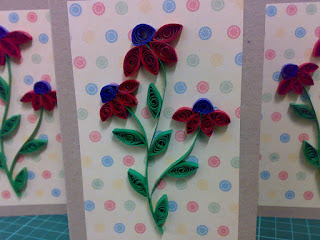 1 strip for the larger petals and half a strip for the smaller one. Form the leaf shape and adhere it under the blue bud. Adhere the leaves. 1 strip for a leaf. 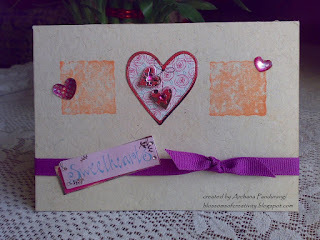 Your card is ready! 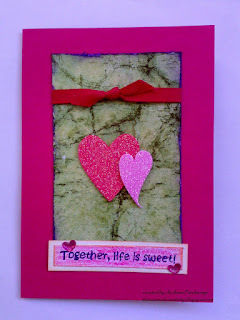 This is last card I made for Valentines day. The sentiment is handwritten. 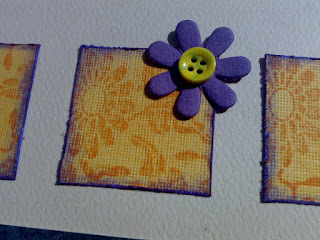 The flower stamp is from HOBBY IDEAS. I used the shadow technique in that. 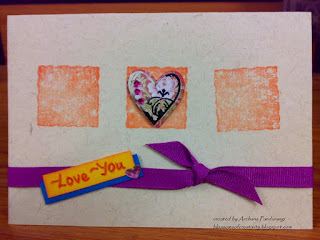 The square stamp is from Stampin' Up! LITTLE SHAPES. I finally got an idea to use it. The heart sticker fit perfectly into it. The sentiment is handwritten. Kept it simple. 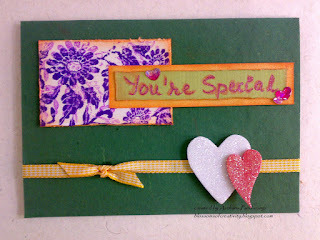 The JUST FOR YOU sentiment is from Stampin' Up! 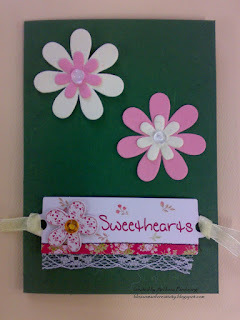 Tags & More. The maroon flowers are punched. 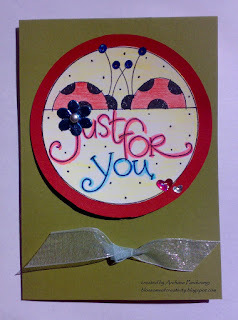 Coloured the ladybirds with water colour pencils. 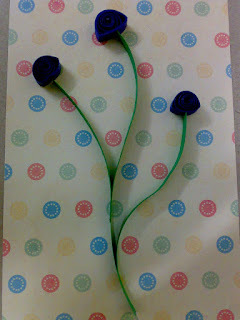 Adhered the blue flower,silver pearl and the two tiny hearts. 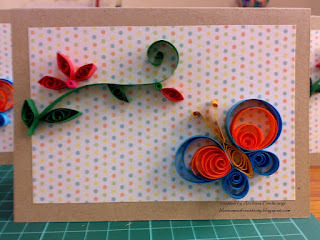 Final touches with the ribbon completed the card. The egdes of the green panel are distressed and inked. 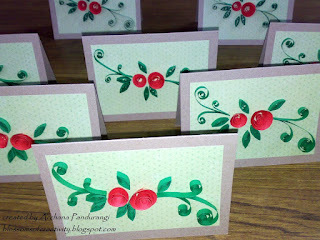 Quick cards. Love those flowers. I tend to use it a lot. This was for another order. 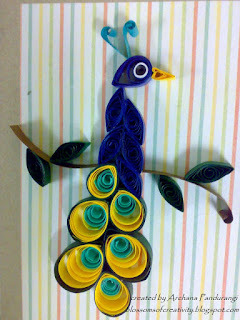 Mass production of quilling is a completely different experience. I made 10 of them. 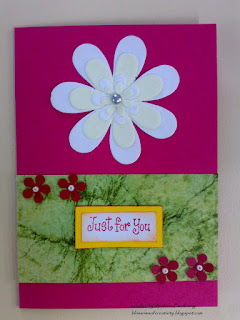 I made this card for CAS52 and CAS51. 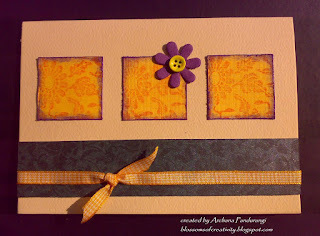 The three squares(3.5x3.5) were cut out, stamped with this floral design,distressed and sponged with violet ink. The DP panel is 15x3. A close up.